Dr. Mario Talajic, MD, FRCP(C), Cardiologist - Electrophysiologist, talks about heart palpitations and supraventricular tachycardia (SVT) diagnosis and treatment options. Palpitations and SVT - Diagnosis and Treatment - Montreal Heart Institute Dr. Mario Talajic, MD, FRCP(C), Cardiologist - Electrophysiologist, talks about heart palpitations and supraventricular tachycardia (SVT) diagnosis and treatment options. Well, palpitations can be caused by a variety of things, and when we talk about palpitations what the patient is describing is a sensation in their chest of the heart beating fast. So, it can be caused by just an accentuation of a normal heart rhythm, or it can be caused by what we call an arrhythmia. An arrhythmia is basically an abnormal rhythm that comes from anywhere in the heart, so you have a little focus that’s somewhere in the heart that has electrical activity and then it gains control of the heart by beating faster than the normal rhythm. And, it can come from the top part of the heart, it can come from the bottom part of the heart, so there are a variety of causes of palpitations. When we see a patient with palpitations, one of the most important things that we have to do is try to make a diagnosis. 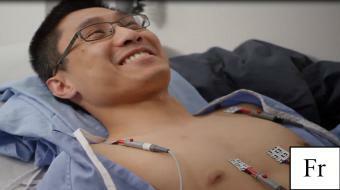 And in order to make a diagnosis, the most important element is documenting the palpitation with an electrocardiogram. So, we have a variety of techniques that we use in order to obtain an electrocardiogram during the palpitations of the patients. Once we do that, we can then establish: is this just a normal accentuation of a normal heart rhythm, for example? If that’s the case it’s quite benign. Or, is it something that’s more serious, is it something that requires attention? One of the causes of palpitations that are usually quite benign are premature atrial contractions or premature ventricular contractions. These are usually known by the patients as skipped beats in their chest. Most of the time these are very, very benign. They’re not associated with any serious heart disease, and most of the time they don’t require any therapy at all. In some patients, they may relate these skipped beats to certain stimulants like coffee, caffeine for example, but not necessarily. Often, reassurance for the patient is enough in these patients. Rarely, though, we may need to use a medication to try to suppress some of these skipped beats, but only in very selected patients. One of the most common causes of palpitations is supraventricular tachycardia, or SVT – we call this SVT. And this is caused by, usually a microscopic fibre in the top part of the heart. And typically the patient will say “I feel well, and then all of a sudden the heart takes off and starts going very rapid, very irregular and can last for minutes and sometimes to hours.” In some cases, the patients even have to come to the emergency room because the arrhythmia will not stop. The long-term options that are available for patients that have this problem are basically threefold. Most patients will have SVT for a number of years before they seek medical attention. Basically what they are doing is they’re living with it. What they’ve discovered is there are certain things that they might do, for example taking big breaths, or taking a big breath and pushing hard, which is called a Valsalva manoeuvre, will actually stop the arrhythmia. But what often happens is that patients after a period of time, these episodes become more frequent, or they last longer, or maybe what might happen is that an episode might not stop. And at that point in time, living with it is no longer a great option for the patient. So at that point in time they have really two other possibilities. The first possibility is to take a medication. Now, medication can be useful, it works about 70 percent of the time, but it means you have to take a medication every day to prevent an occurrence of arrhythmia that might occur perhaps once a month. And, many of our patients are quite young, and not particularly happy about taking a medication for the rest of their days. So the third option that’s available is called a catheter ablation. And the principle of a catheter ablation is that we know that the arrhythmia is coming from a very microscopic fibre located within the heart which is electrically active. So what happens during a catheter ablation is a patient comes into the hospital, what we do is after an anesthesia we place catheters through the groin area - and these catheters are brought up inside the heart and we use x-rays to place these catheters. 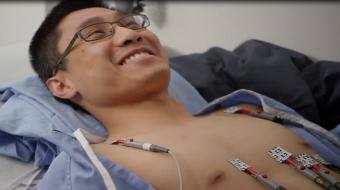 After the catheters are in place, what we do is we stimulate the heart electrically, and we reproduce the same arrhythmia that the patient had on their own. And the principle there is that imagine there is a fibre – we’ll say that this is the fibre, and obviously it’s much smaller, it’s microscopic, we place a catheter and we try to touch the fibre with that catheter. And once we know that the catheter is touching the fibre in question, we pass either an electrical current in the catheter, which heats the tip of the catheter, or we have a different technology that actually cools the tip of the catheter. So, either we heat it to 60 degrees Centigrade, or we cool the tip of the catheter to minus 70 degrees Centigrade. And what the effect of that is is that it basically destroys the little fibre that’s in question, so with this the patient is cured from the arrhythmia and doesn’t need to take medications thereafter. So this is a very interesting alternative for many of our patients. Success rate of catheter ablation is on the order of 90 to 95 percent. The complication rate is one to two percent overall. One of the aspects associated with arrhythmias in general is the stress that’s associated with it. To give you an example, patients may have arrhythmias for a number of years, they cope with it, but when they seek medical attention they’re told that they’re stressed, that it’s related to something else, and so no one recognizes that in fact they have a cardiac problem. Even after the condition is established and a patient is diagnosed, for example with a ventricular tachycardia, it generates a lot of anxiety, even if they’re treated for example with medications, because the patient has this fear. What happens if I go on vacation? I go canoeing up North on a lake and I get an attack? What do I do if I can’t stop it? What if I go down South during the winter and I’m somewhere on a beach and I get an attack and I can’t stop it? So these things weigh on the patient over the years, and that’s why a catheter ablation provides a more definitive cure for the patient, and in the end becomes much more reassuring for the patient. For more information, if you have palpitations or someone in your family has palpitations which are suggestive of arrhythmia, you should contact your doctor. Your doctor is the best person who’s placed to know what resources are available for you, whether a referral is necessary for you, and whether additional tests are necessary.